This image has been lying on my desk for quite a while. So time for a quick article about it. 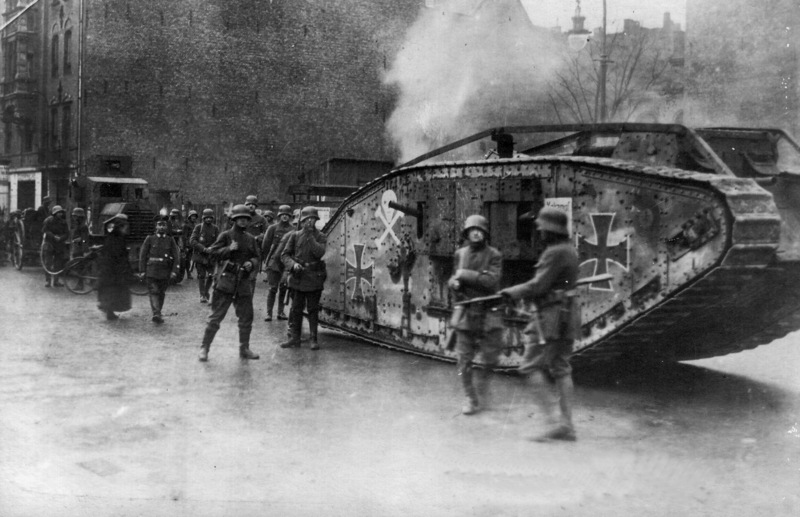 It is a rare one, showing a british Mk IV tank captured by the german army in WW1 now used by Freikorps units during the supression of the Spartacist uprising in Berlin, in January 1919. In January 1919 all remaining armoured cars and vehicles of the german army were regrouped in Berlin under the command of Reichswehrgruppenkommando 1, forming three Abteilungen. One of these Abteilungen was designated Schwere (heavy) Kampfwagenabteilung and consisted of two british Mark IV tanks and one german A7V tank (Heidi) formerly beloning to Freikorps Maerker. 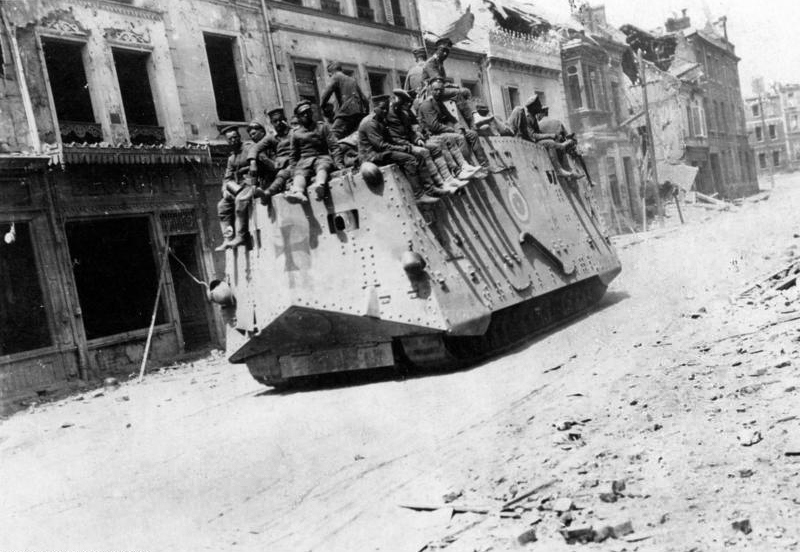 They stayed in use until Summer 1919, when all armoured vehicles had to be surrendered to the allies as dictated by the Treaty of Versailles. 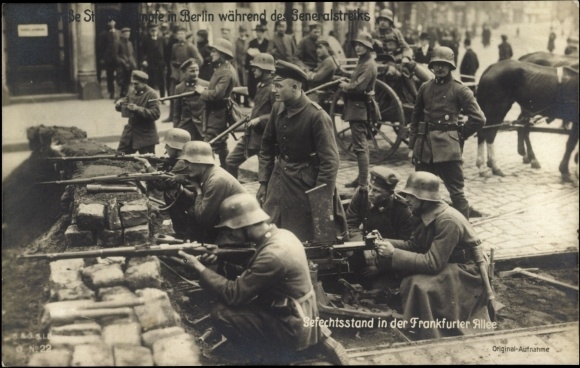 The Spartacist uprising (German: Spartakusaufstand), also known as the January uprising (Januaraufstand), was a general strike (and the armed battles accompanying it) in Germany from January 4 to January 15, 1919. Its suppression marked the end of the German Revolution. The name “Spartacist uprising” is generally used for the event even though neither the ‘Spartacist League’ of Rosa Luxemburg fame (aka Spartakusbund) nor the Communist Party of Germany (KPD) planned, initiated nor led this uprising; each participated only after popular resistance had begun. This Uprising contributed to German disillusionment with the Weimar Government. Their leaders were Karl Liebknecht and Rosa Luxemburg. Several workers spontaneously seized the editorial office of one newspaper in the Kochstraße in Berlin and erected barricades on the streets. This attracted more workers who blocked further streets in the newspaper quarter- including the office of Germany’s Social Democrat SPD organ “Forward” (Vorwärts). This Social Democrat paper had printed articles hostile to the Spartacists since the beginning of September. The leaders of the USPD and the KPD/Communist Party decided to support this worker-action, appealling for a general strike in Berlin on January 7. The strike garnered about 500,000 participants who surged into downtown Berlin that weekend. In the following two days however the strike leadership (known as the ad-hoc Revolution Committee) failed to resolve the classic dichotomy between militarized revolutionaries committed to genuinedly new societies and reformists advocating deliberations with Ebert. Meanwhile the strikers in the occupied quarter obtained weapons. Within the Communist Party there was further dissent. Karl Liebknecht, unlike Rosa Luxemburg, supported a militant coup over Ebert’s government, else the KPD would be alienated from worker elements planning the coup. At the same time some KPD leaders tried persuading state military regiments in Berlin, especially the Volksmarinedivision, to their side. Their armed presence was supposed to instigate fighting. This was unsuccessful because most soldiers had either gone home or because their loyalty to the “Rat der Volksbeauftragten” (ie., the flag of the regiment). On January 8, the KPD left the Revolution Committee after USPD representatives had invited Friedrich Ebert for talks. While these took place, the workers found out about a flyer published by Vorwärts titled “Die Stunde der Abrechnung naht!” (The hour of vengeance is coming soon!) and about the Freikorps (anti-Republican paramilitary organizations, who fought the Weimar Republic and the November Revolution), whom the SPD administration had hired to suppress the workers. Ebert had ordered defense minister Gustav Noske, also a member of the SPD, to do so on January 6. Then the Revolution Committee stopped talks with the SPD. 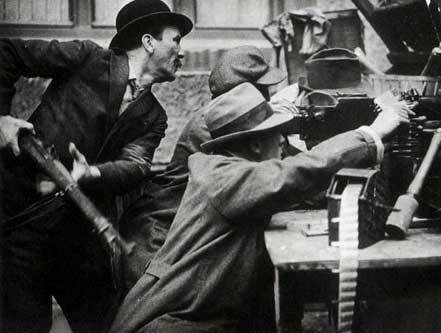 The Spartacist League then called for its members to take part in armed combat. On the same day, Ebert ordered the Freikorps to attack the workers. The former soldiers still had weapons and military equipment from World War I, which gave them a formidable advantage. 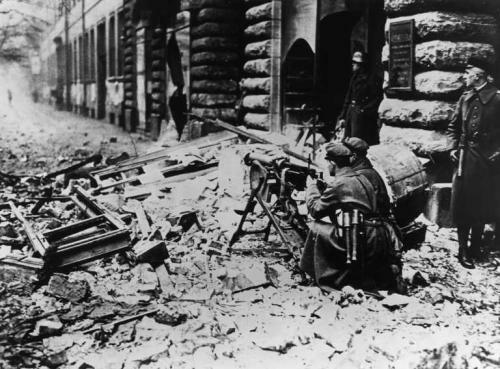 They quickly re-conquered the blocked streets and buildings; many of the workers surrendered. 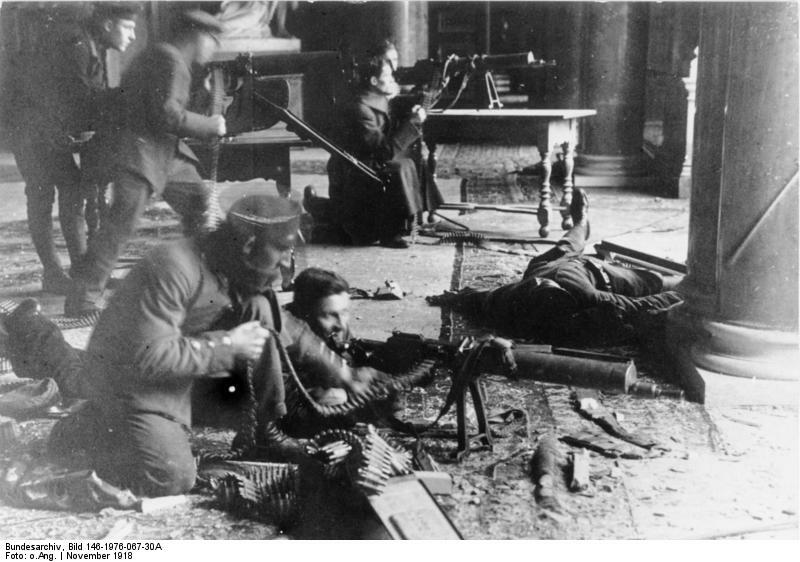 Around 100 civilians and 17 Freikorps soldiers died during the fighting. Liebknecht and Luxemburg were captured by Freikorps soldiers and killed.